Wow. 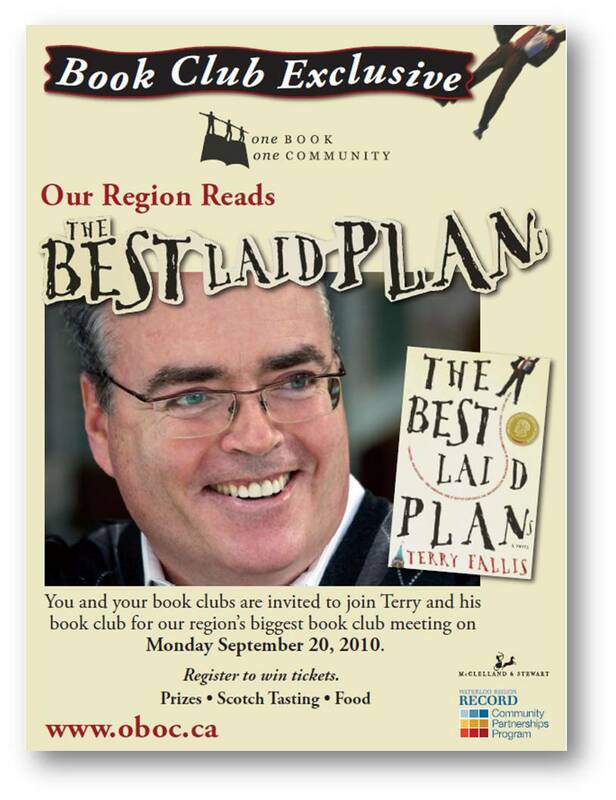 The Best Laid Plans has been voted onto the CBC Canada Reads Top 40 Essential Novels of the Decade list. I’m blown away and very grateful for all the support. I didn’t dare dream of making the cut. But now, the slate is wiped clean again, and the voting begins anew as the Top 40 list is winnowed down to the Top 10, from which the celebrity panel will select the five Canada Reads books. Then of course they duke it out on the radio, leaving one book standing, the Canada Reads 2011 selection. So, once more to the barricades! So at the risk of wearing out my already overtaxed goodwill with you all, you can now vote to put The Best Laid Plans into the Top 10 here. You can only vote once, but there’s no time like the present. In the graphic below, you can see the cover of TBLP in the bottom row. 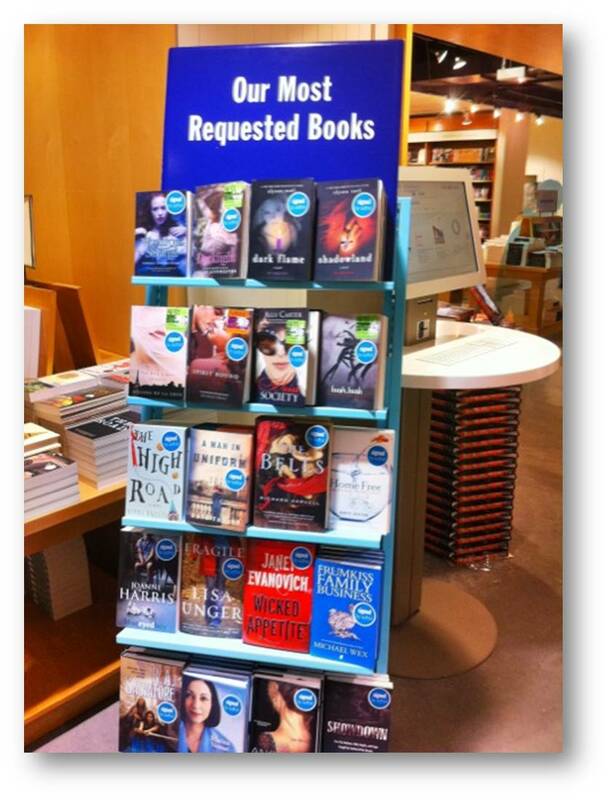 It’s nice that my friend Cathy Marie Buchanan‘s great debut novel, The Day the Falls Stood Still also made the list. Thanks again for all the support. I am truly grateful. Just when I thought we’d finished with the reviews, the Edmonton Journal pops with a nice take on The High Road. While the headline looks like the Ottawa Citizen review, the actual article itself is completely different. I arrived on Vancouver’s funky and artsy Granville Island on Thursday afternoon for the 23rd Vancouver International Writers & Readers Festival. The fun for me actually started in Toronto’s Peason airport. I was grabbing a bite to eat before my four and a half hour foodless flight when I struck up a conversation with a lovely woman from Edmonton sitting next to me at the bar. I was checking the festival schedule on my iPad when she asked if I were a writer. 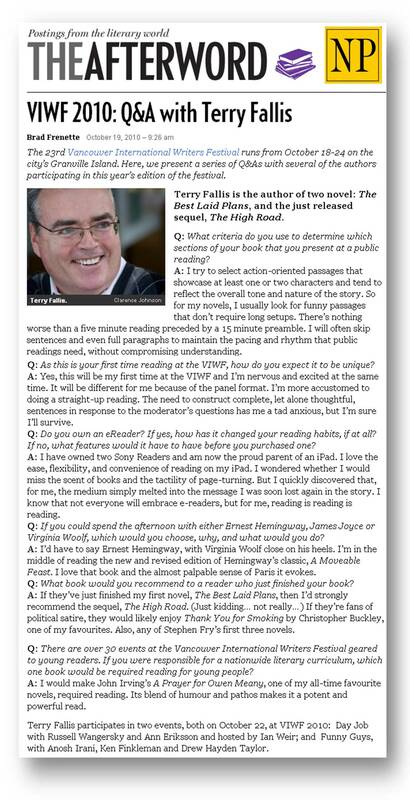 I replied in the affirmative (still thrilled to be thought of as a “writer”). She asked what I had written and I mentioned my two novels. Well the guy sitting next to her looked over and said “You wrote The Best Laid Plans? 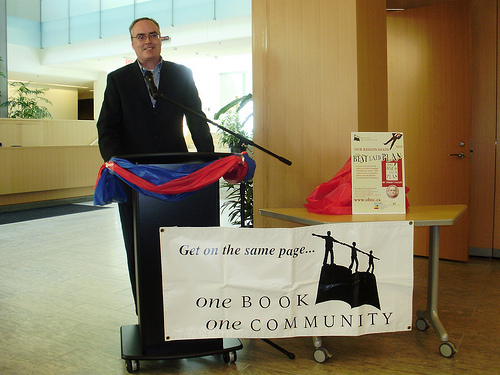 I loved that book!” He lives in the Kitchener Waterloo region and he and his wife had both read the novel for One Book, One Community (for me, the program that keeps on giving!). What a small world. It was quite surreal. He even took a photo with his cellphone to prove to his wife that we’d actually met. I have yet to stumble upon a subway rider reading one of my novels, but this little encounter came close. After some more lively conversationwith my two new friends, I had to dash to catch my flight. The Westjet crew are always a little more laid back than on Air Canada. My favourite line from the flight attendant leading us throught he pre-flight emergency procedures was “If you would give us your undivided attention for the following safety demonstration… we’d be shocked.” Nice one. The flight was uneventful and we landed on time in Vancouver. I was met at the airport by Andrew, a friendly festival volunteer, and we jumped in his car for the drive to Granville Island. They really treat you royally at VIWF. I checked into the beautiful Granville Island Hotel, the headquarters for the festival, signed in at the authors’ registration table, picked up my author’s kit, and set out in search of food. I was starving after the long flight. I grabbed a bite at a local restaurant and mapped out my thoughts for my two panels the next day. Despite the time change, I decided to go to one of the evening sessions. 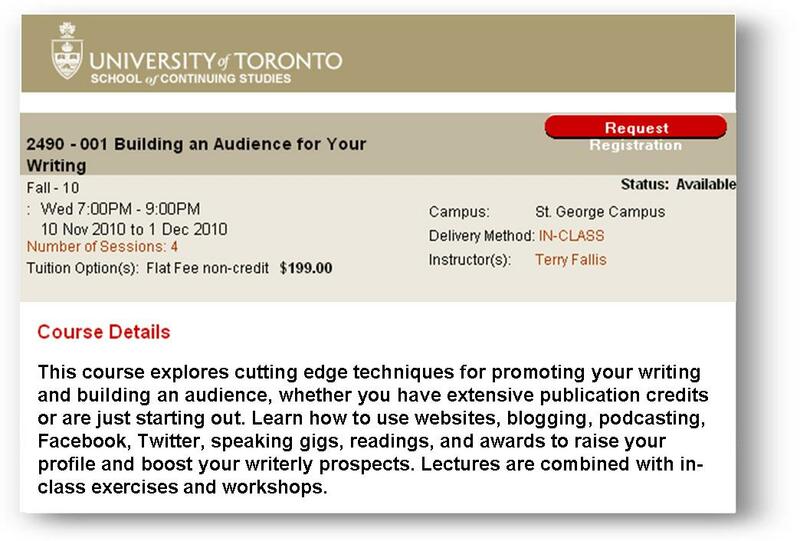 Authors can attend any session for free, space permitting. So I sat in on a session called “Old Friends” with msytery/thriller writers Linwood Barclay, Gail Bowen, and scotsman Quintin Jardine. 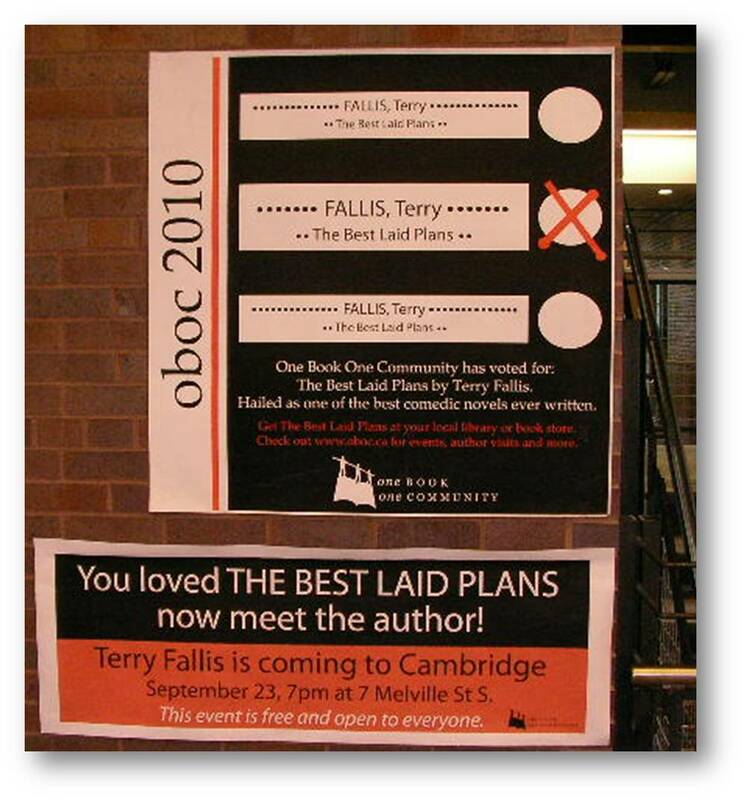 It was all about the challenges and glories of writing recurring characters, book after book. Hence “Old Friends.” I thoroughly enjoyed the session. Listening to Quintin Jardine’s thick Scottish brogue made me realize what a terrible, pseudo-Scottish accent I give to Angus when I’m recording the podcast or doing a reading. Oh well. I’ll keep working on it. Still on Toronto time, I was exhausted by the end of it and even skipped the authors’ hospitality suite in the hotel to head directy to bed. Thursday morning, after breakfast, I attended a session called “Raw Material” with four very well known writers: Jack Hodgins a brilliant Canadian novelist I’ve enjoyed for years; Charlotte Gray, the award-winning non-fiction writer who penned Reluctant Genius, the wonderful bio of Alexander Graham Bell; Terence Young, a very talented short story writer; and Don McKay, a celebrated Newfoundland poet. I was already familiar with Hodgins and Gray, but I was really happy to be introduced to views and works of Terence Young and Don McKay. They discussed how they found and used the “raw material” that they eventually shaped into their award-winning works. It was very interesting. The point of the session was to explore how our day jobs influenced our writing, for better or worse. A good crowd showed up and the moderator, Ian Weir, author of the great novel, Daniel O’Thunder, did an admirable job drawing us out and keeping the discussion lively. We all read a selection from our novels before Ian led us into conversation and then opened the floor for questions. Ken Finkelman was supposed to join us but in the end was unable to make it out to Vancouver. It was nice to renew contact with Drew Hayden Taylor, with whom I’ve read on several occasions in the past couple of years. I blurbed his novel, Motorcycles and Sweetgrass, which was just shortlisted for the Governor General’s Award. 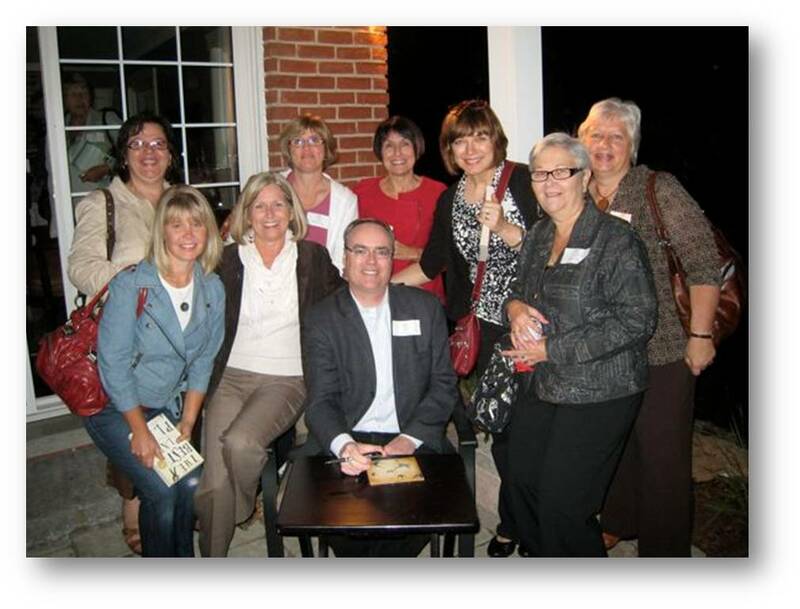 A very funny guy, Charlie Demers, a local stand up comic and author, hosted and moderated the discussion. He did a wonderful job and had clearly done his homework by reading all of our books. Anosh Irani was concerned beforehand that his novel isn’t really that funny, and was never intended to be. But in fact, both he and his novel were hilarious. As usual, we all read first before diving into a discussion about humour writing. 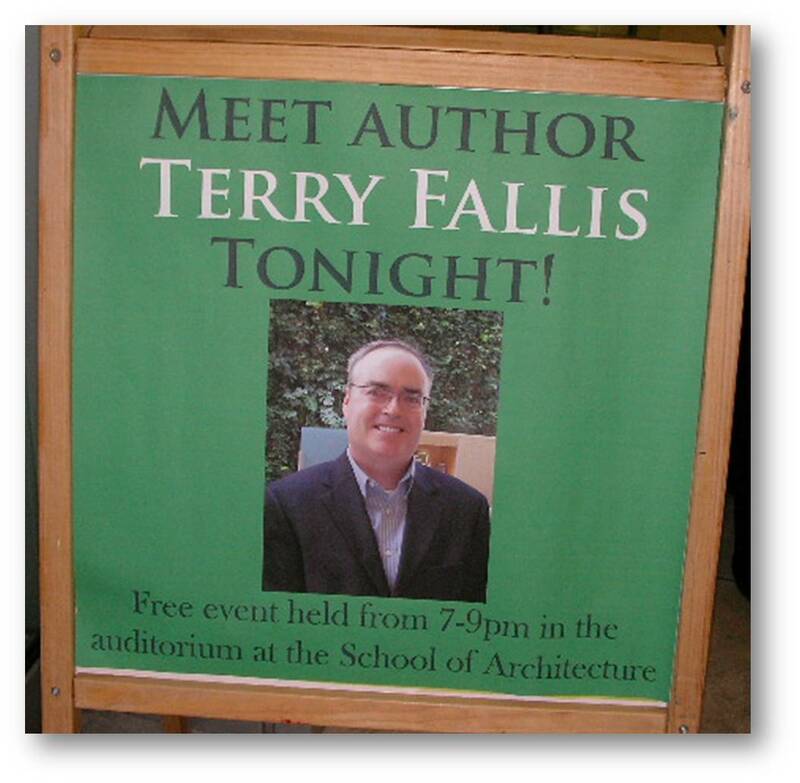 Afterwards, we answered audience questions, signed books, and generally chatted up the crowd. Later on that night, I attended the musical tribute to Paul Quarrington featuring his band, Porkbelly Futures, and Dave Bidini. The music was fantastic, but it was also sad without Paul there to enjoy it too. I had such an amazing time at the festival. There’s something about being immersed in the world of writers and readers that made the few days I was there, memorable and fun. I also got to meet and speak with a number of big name writers including Steven Galloway, Camilla Gibbb, Kathleen Winter, Dave Bidini, and Charles Foran. 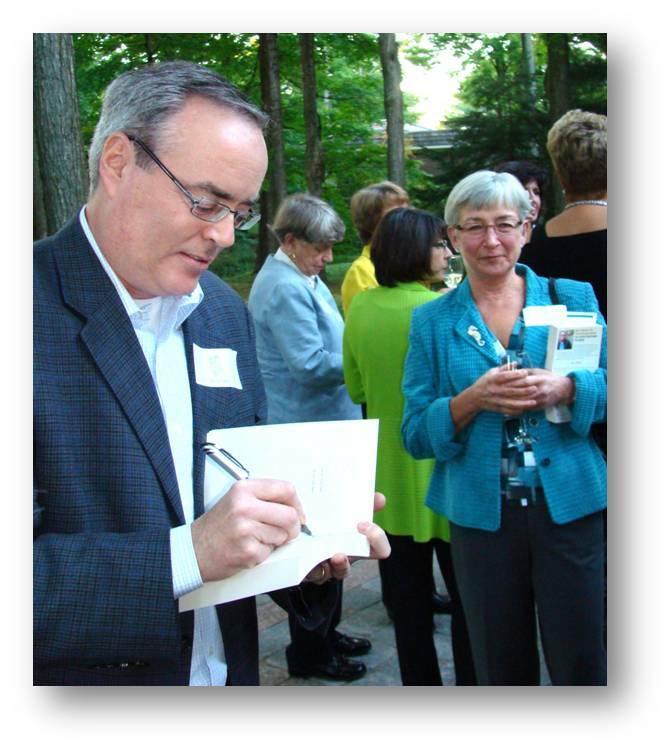 For the most part, I remained calm when meeting these literary superstars. I even got to have lunch with the 2009 Leacock Medal winner, my friend Mark Lerien-Young and his other half, Rayne. While it’s nice to be back home, it sure was great participating in the Vancouver International Writers Festival. 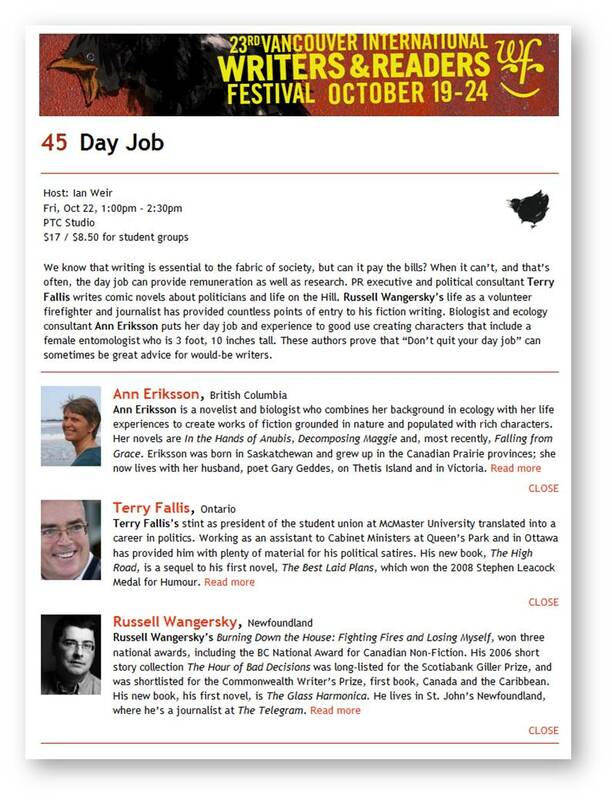 I’ll be leaving for Vancouver on Thursday for the Vancouver International Writers Festival. I’m really looking forward to it. I’ll be doing two readings and speaking on two panels on Friday, October 22nd. The first panel is on Friday afternoon and is called Day Job. It will revolve around that familiar challenge of fitting writing into your daily life while juggling a family and a full-time job. 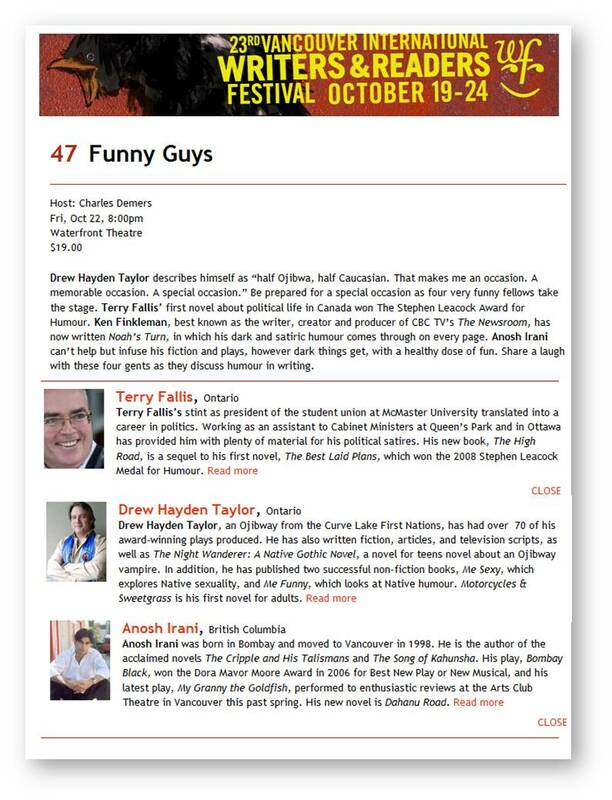 The second session is in the evening and is called Funny Guys. The focus, as youÂ might expect, will be humour in writing. 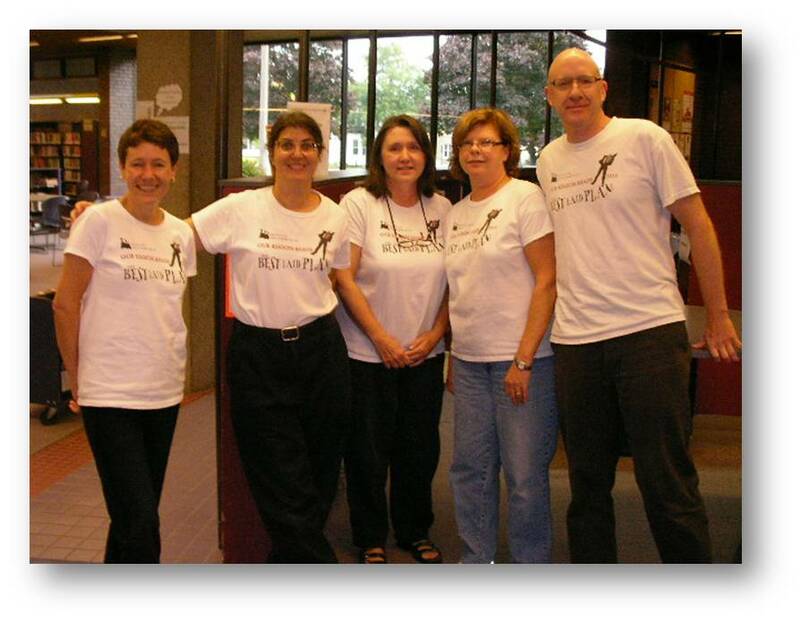 Canada Reads is set up a bit differently this year as they celebrate their tenth anniversary. 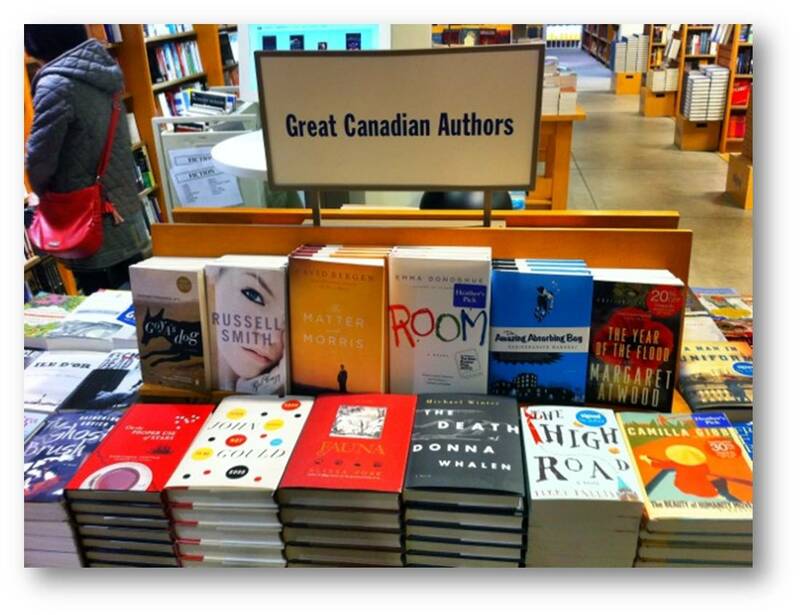 To begin with, the readers of Canada (that’s you!) have a chance to nominate their favourite novels. 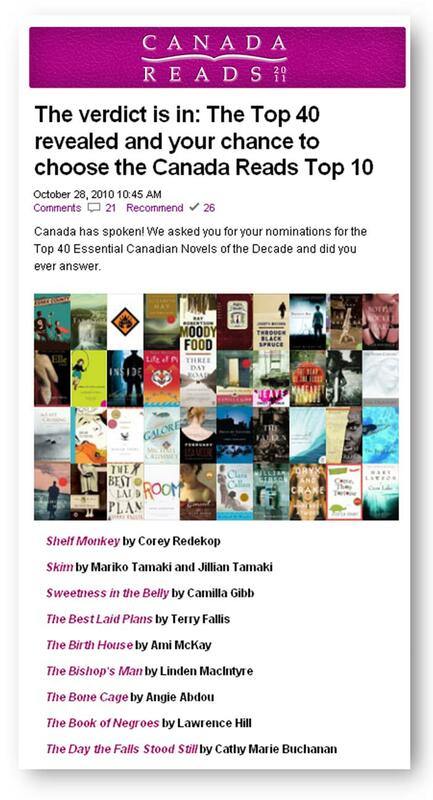 According to the numbers of nominations for each book, a Top 40 essential Canadian novels list will emerge. What a thrill it would be to make this list. Then a Top 10 will be chosen from the Top 40 by the celebrity panel (yet to be named). Then the final five books will be announced, chosen from among the Top 10. Finally, the panelists will duke it out on the air and pick a winner. Got it? 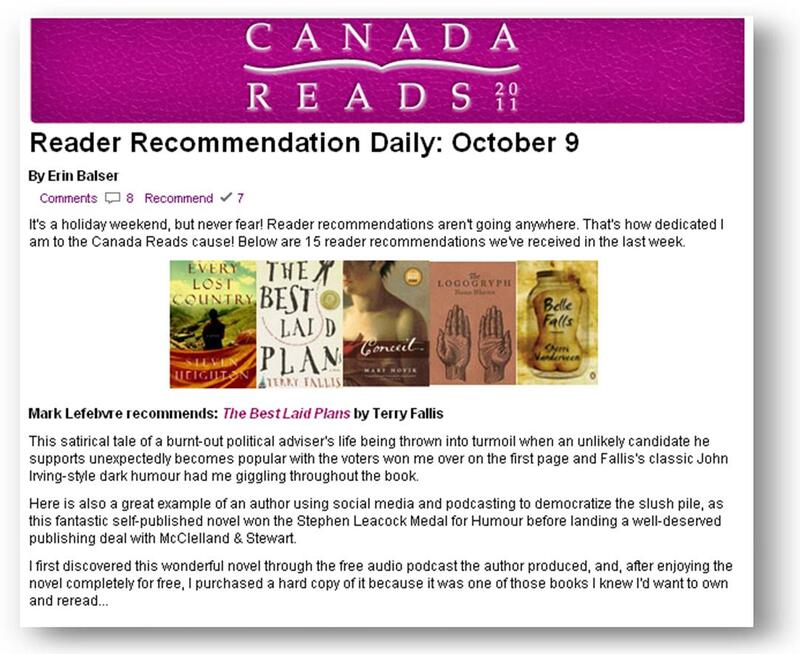 So with all of this in mind, I just thought I’d, with humility and modesty, gently nudge you towards the Canada Reads Reader Recommendation site where you can, in mere seconds, nominate a favourite novel or novels (and I have a couple of suggestions right off the top of my head in case you’re at a loss for novels to recommend…). It seems that numbers count, so don’t feel you have to limit yourself to submitting only once! It seems both of my novels have already been recommended, which is truly wonderful, but clearly being recommended only once certainly won’t put The Best Laid Plans or The High Road anywhere near the coveted Top 40. So I’d certainly be grateful if you would considerÂ recommending early and recommending often! 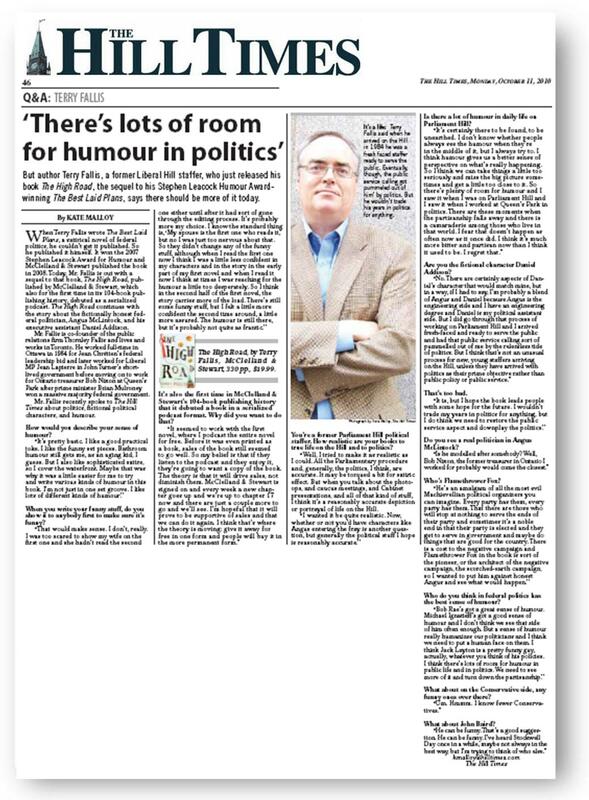 My sincere thanks to those who have already recommended TBLP and/or THR for this honour. I really do appreciate it.